Dara Jackson-Garrett entered Harvard Law School hoping for a career in public interest, and by the end of her first year, she’d settled on becoming a public defender. 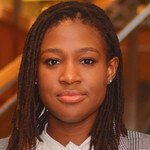 But Jackson-Garrett, who is 27 and describes herself as a first-generation law student from a low-income background, still found herself interviewing for internships at private law firms because, “of course, the money,” she says. She isn’t the only one to face that choice. The percentage of law graduates choosing to go into private practice has been increasing over the last three years and was at 54.4 percent of the 2017 graduating class, according to the National Association for Law Placement. But the number of students choosing public interest law has remained stagnant for years, coming in at only 7.2 percent in 2017. Such roles include working at nonprofits providing legal services to the poor, as prosecutors or public defenders, and in government. “When you do public interest you’re kind of going against the river, you’re going against the tradewinds,” says Jackson-Garrett, now in her second year at Harvard Law. When you do public interest you’re kind of going against the river, you’re going against the tradewinds. Some say those winds are getting stronger. While law school tuition and law firm pay are both rising, President Donald Trump has moved to eliminate student loan forgiveness for public service lawyers in his most recent budget. The result is “the perfect storm for a huge drought” of attorneys willing to work in the public sector, says Michael Barrett, the state public defender director for the Missouri State Public Defender System. At the same time, there’s a glaring need for lawyers committed to representing the indigent and other vulnerable populations. The public defender system in Missouri, for example, is currently so understaffed that clients sit on waiting lists for lawyers who sometimes handle more than 200 cases at a time, according to Barrett. With the country’s justice gap growing wider, some advocates are asking — what can law schools do to keep public-interest-minded students from getting blown off-course? On the list of ways law schools can swell the ranks of public interest attorneys, reducing student debt is near the top, experts say. “One of the things that can lead at least some of our students to shift their path from wanting to pursue public interest work into deciding that they’ll go into the private sector is fear that they’re not going to be able to pay their debt and manage their finances,” says Gillian Lester, dean and the Lucy G. Moses professor of law at Columbia Law School. Those fears are well-founded. Legal aid attorneys are some of the lowest paid in the country, with median salaries for new legal-services lawyers hovering around $48,000 per year in 2018, according to the NALP. 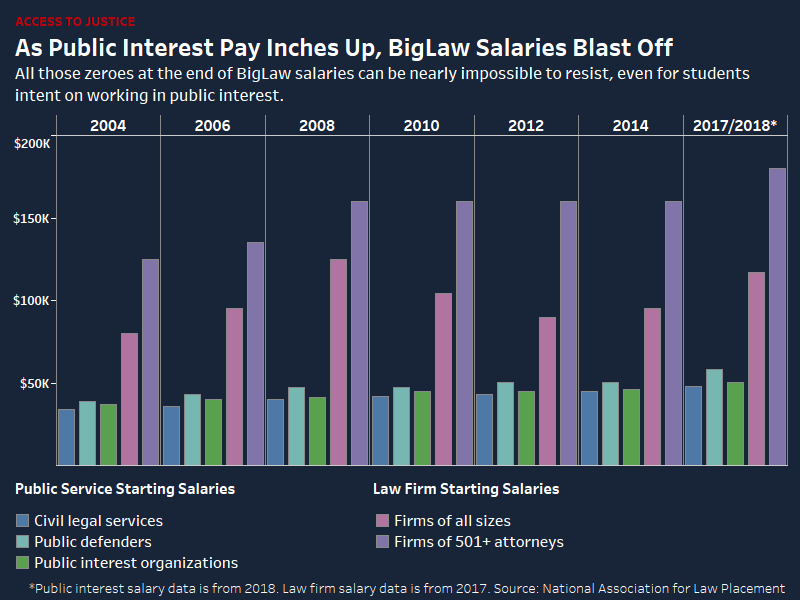 That number is dwarfed by pay at BigLaw firms, where the median first-year salary was $135,000 in 2017, according to the NALP, and some firms are now offering associates starting pay as high as $190,000 a year. All those zeros can be nearly impossible to turn down for young lawyers graduating with an average of over $134,000 in student debt if they attended a private school, according to the American Bar Association. “Just because somebody goes into law school with designs to do public sector or public defender work, doesn’t mean that it’s a financial possibility for them when they graduate,” Barrett says. The federal Public Service Loan Forgiveness Program, signed into law in 2007, was designed to forgive student loan debt carried by lawyers and others who choose to work full-time in government or certain types of public service after they’ve made 10 years of payments. But the program has been accused recently of rejecting approximately 99 percent of applications for loan forgiveness, sparking several lawsuits. President Trump’s 2020 budget proposed eliminating it altogether. Faced with that reality, Columbia and an increasing number of other law schools are helping graduates who pursue public service jobs to repay their student loans. 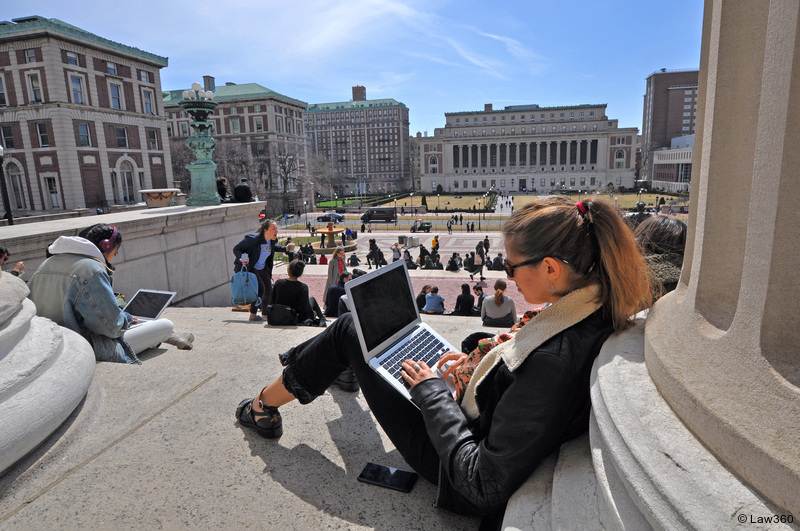 Columbia’s Loan Repayment Assistance Program covers 100 percent of loan payments for graduates working in public interest and making less than $55,000 a year. For those making more than $55,000, one-third of what they earn above that amount goes toward loan payments with the school covering the rest. It’s very compelling work. And it’s the kind of work that’s important for people’s everyday lived experiences. David Morales, who graduated from Columbia Law in 2012, said the school’s LRAP program makes it possible for him to work as an attorney at the Northwest Justice Project in Yakima, Washington. 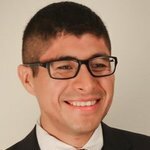 Morales, who grew up watching his parents labor as immigrant farm workers in conditions he described as “something between sweatshops and normal exploitation,” now provides legal help to farm workers like his parents. Morales, who will make $74,000 this year while facing $24,000 in student loan bills, insists he couldn’t maintain that career in legal aid without the LRAP program, which will cover $16,000 of his loan payments this year. Knowing he had that financial backstop is what gave him the “confidence” to accept the lowest-paid of three public interest jobs he was offered out of law school, he said. “I found a really good place and I didn’t have to really worry about the financial implications of doing that job,” Morales said. But the problem, and its solution, come down to more than just dollars and cents. The job recruitment process at many law schools, where interviewing for BigLaw internships often begins shortly after students’ first year, can also steer students away from public interest jobs. Within weeks of starting their second year, many students already have internships lined up for the following summer, and many of those internships will become permanent jobs after graduation. “As a 1L, there are hundreds of law firms coming to campus wining and dining you already, already they’re having receptions and wooing you with their nicest associates and most shiny party favors,” says Alexa Shabecoff, assistant dean for public service at Harvard Law’s Office of Public Interest Advising. Those firms don’t woo students so early on their own. They come because they’re invited by the schools, many of which, like Harvard and Columbia, organize early interview programs, or EIPs, that encourage students to meet with firms and attend their events. Jackson-Garrett says this unofficial “marriage between firms and law schools” puts intense pressure on students like her. Those students usually have to wait until after they’ve graduated and passed the bar exam to begin applying for jobs, which are also fewer and sometimes more competitive, experts say. Graduates often find themselves doing fellowships to get a foot in the door. In an effort to change that dynamic, schools such as Northeastern University School of Law are trying to give students more opportunities to explore public service work earlier so they see what the options are. The school requires every first-year student to take a course where students research and provide other help to public-service clients like the New England Innocence Project, says Renay Frankel, the school’s associate director for public interest and government at the Center for Co-Op and Career Development. Northeastern also has a public interest requirement that students fill by doing internships with public interest organizations, working with clinics providing legal services to underrepresented communities or doing uncompensated legal work focused on access-to-justice issues. “Just the opportunities to do more internships in public interest is a really effective way to get students really excited about it and explore the area of public interest law,” Frankel said. While these initiatives are important steps, others say what really needs to change is the culture, and even the language, of the schools themselves. All too often, law students are bombarded with the message that “you do have to go to the private sector and that’s what’s valued and that’s what makes you a real lawyer and that’s where you get your training,” Frankel said. Jackson-Garrett says she’s seen exactly that kind of messaging at Harvard. The way professors talk to students and the hypotheticals they pose in class all rest on “the assumption ... that most students are going to go to firms,” she says. Even the names of Harvard’s career offices — Office of Career Services for students going to private firms and Office of Public Interest Advising for those interested in public interest — show a bias for corporate interest work, says Pete Davis, who graduated Harvard Law in 2018. While there, Davis authored a much-discussed report outlining what he sees as a law school “culture that fails to spark public-spiritedness,” pointing out, for instance, that his only required field trip during his 1L year was to a corporate interest law firm. Harvard’s Shabecoff agrees with some of Davis’ findings and disagrees with others, but “it’s definitely generated some conversation here,” she says. University of California, Irvine School of Law is one school trying to raise the profile of public interest work in students’ everyday experiences. Before students start school, the readings they do at orientation are usually public service-based, says Anna Davis, the school’s director of public interest programs. All first-year students are required to do interviews with real clients at a legal services organization or public defender’s office. And students can then get involved with the school’s pro bono program starting in their first year. Davis says over 90 percent of the school’s students do pro bono work at some point, and every student is required to participate in a clinic, with some going on to do advanced and secondary clinics. “So they’re really engaging with vulnerable populations and causes that are in need of representation throughout their law school career, at every turn, if they choose to,” Davis says, something she hopes will imbue all students with a public service ethos, even for those who end up going to private firms. After flirting with the idea of interning at one of those firms, Jackson-Garrett wound up turning down all her firm callbacks and instead, is planning to intern — unpaid — at the Bronx Defenders, a public defender nonprofit in New York. It was a difficult choice, she said, largely because of “the financial component.” But Jackson-Garrett said interviewing with firms made it very clear that BigLaw wasn’t the path for her. “I am certain that going into public interest is exactly what I should be doing,” she said.